Front row: Sisters Aqela, Helen, Emanita, Margaret,Julienne Marie, Marie Claire. Seated: Sisters Pelenatita, Athanasie, Georgeanne Marie, Suliana, Jennifer, Kathleen, 3rd row: Judith,Danielle, Maria Goretti, Lasela, Ana, Helene, Telesia, Agnes, Cristina, Marisa. Back row: Joan Marie, Aloisia, Maria Koleti, Jacinta, ,Lutekate, Monika, Mary Jane, Colleen, Athanasie, Joyce Ann. Here at our central house in Waltham, Massachusetts, January has been a month of hospitality - greeting our Sisters from near and far, as well as friends and family members. Sr Georgeanne Marie, our congregational leader and her Council arrived from Rome in late December to welcome Regional Leaders from Asia-Pacific, Africa-Europe, Oceania and the Americas, as well as Sisters who are directly concerned with care of our elderly Sisters. Thirty-four Sisters had been called together to take part in this "Eldercare Workshop" to see how we can best address the needs of our senior Sisters in different parts of the world. The workshop was held from December 28th to January 10th and included presentations on the philosophy of aging, gerontology, pastoral care, the spirituality of aging, community life, and self-care for caregivers. There was a great depth of sharing of personal experiences and different situations in different countries. On Saturday, January 5th, Sister Mele Senitila Latu, smsm, made her perpetual vows at the Mass for the Vigil of the Epiphany at Sacred Heart parish in Waltham, Massachusetts. Sister Senitila is originally from the island nation of Tonga in the South Pacific. 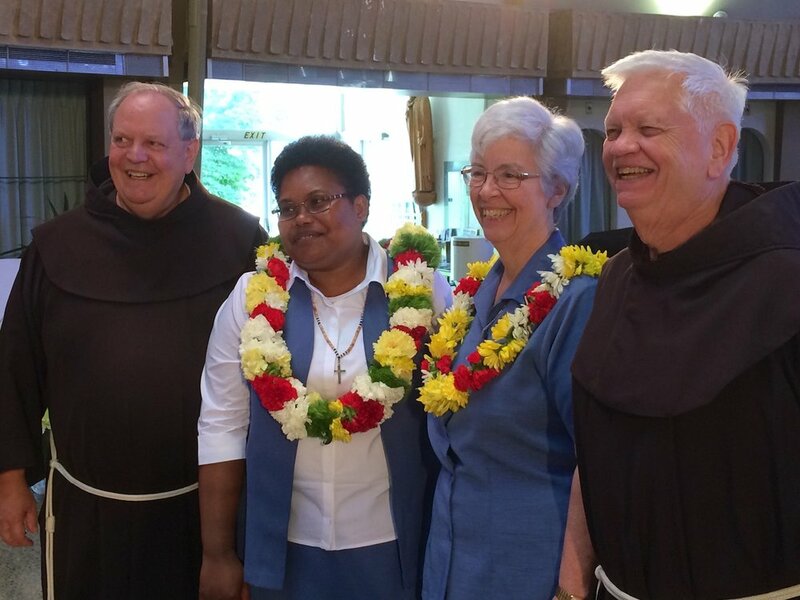 She entered the novitiate of the Marist Missionary Sisters in New Zealand, and made her first vows there 6 years ago. She was missioned to Madagascar and served there for four years at a Center for the Advancement of Women. She came to the USA in 2017 for Ongoing Formation and Studies. 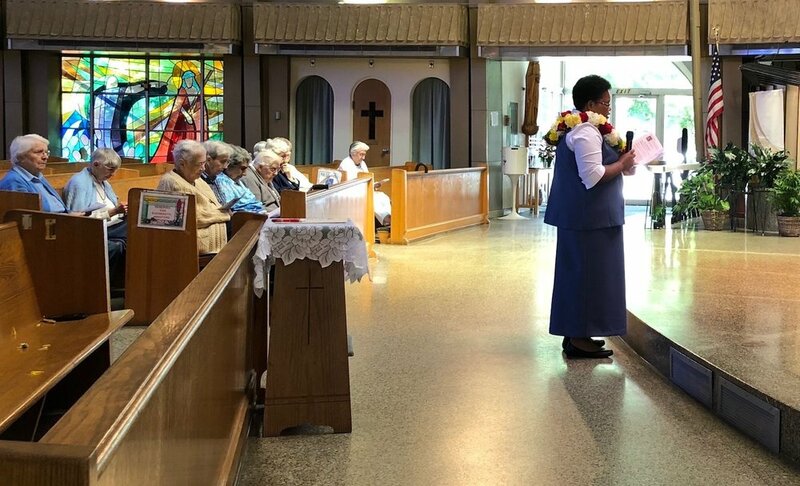 This joyful celebration brought together all the SMSM Sisters in the area, the parishioners of Sacred Heart, and others who knew Sister from her volunteer work at Maristhill Nursing Home and at the St Mary's After-School Program. In addition quite a few relatives arrived from as far away as New Zealand, California, Florida and Texas, bringing a wonderful Tongan flavor to a cold and rainy night in Massachusetts. There was a joyful celebration after the Mass with food, song and dance from the different cultural groups present. Before the Mass: Father Dennis Wheatley OFM, pastor, with Sister Senitila and Viliame and his daughter Tatila, who came from New Zealand. During the Mass, Sr Georgeanne Marie Donovan, congregational leader (right) listens as Sr Senitila recites her vows to live forever her consecration to God in poverty, chastity and obedience, according to the Constitutions of the Missionary Sisters of the Society of Mary. Sister Senitila (center) with family members and some of the Sisters who gathered in the parish hall for the celebration after the Mass. We wish every blessing of Christmas for our families, friends and partners in mission throughout the world. May this celebration of the coming of the Lord bring hope, confidence and joy to each one. You will be remembered in prayer today by the Marist Missionary Sisters. 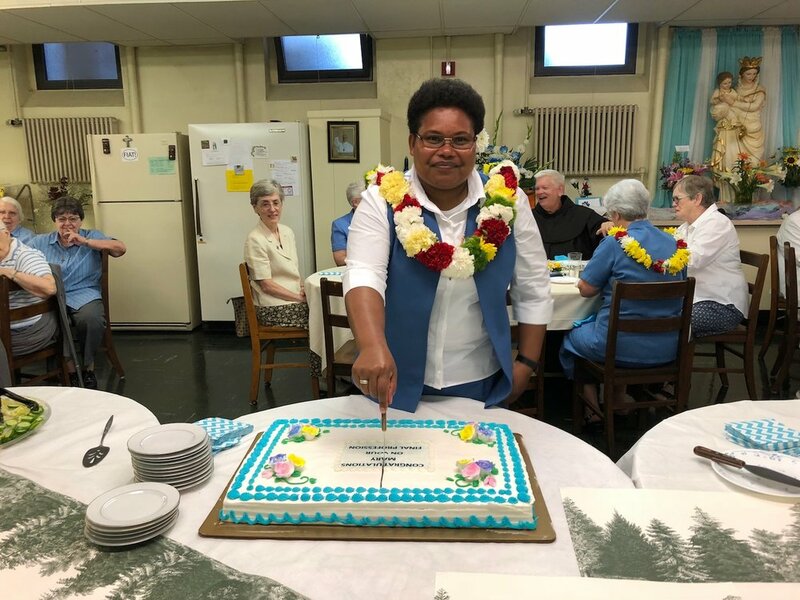 Sister Mary Eve Felesi, from the Solomon Islands, made her perpetual vows as a Missionary Sister of the Society of Mary at Sacred Heart Church in Waltham, MA, USA on June 30th, 2018. 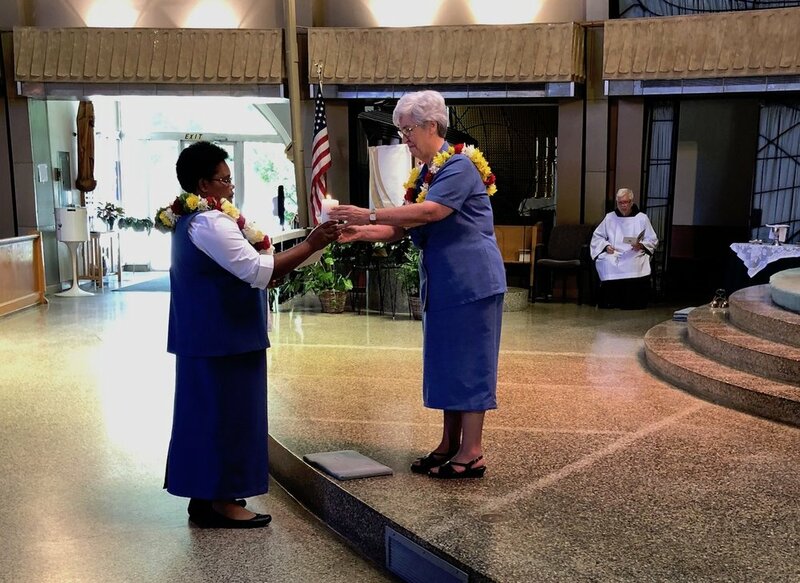 Mary was one of a group of six Sisters in Temporary Vows who have been participating in a Program of Ongoing Formation from October 2017 to July 2018 here in the USA. The Sisters are from six different countries of origin: Togo, Rwanda, Sri Lanka, Tonga, Kiribati and the Solomon Islands. They had each been missioned in other countries: Madagascar, Senegal, Italy, Vanuatu and Colombia. These months were a time of deepening reflection on our way of life as consecrated religious women, living the vowed life in an apostolic missionary congregation and in the spirit of Mary, mother and first disciple of the Lord. The Sisters also began online studies towards a degree in Theology from the International Dominican University during this time. It was with great joy that we were able to celebrate the perpetual vows of Sister Mary towards the end of this Program. Sister Georgeanne Marie Donovan, our congregational leader, was present to receive the vows. Father Ken Thibodeau SM was the main celebrant and homilist, and Father Denis Wheatley OFM, our pastor, and Brother Damian Johnson OFM joined in the celebration, along with many Sisters from the area and friends who had gotten to know the Sisters through their volunteer work at St Mary’s After School Program and at the Maristhill Nursing and Rehabilitation Center. We are very grateful for all those people – near and far – who have supported Sister Mary and the other Sisters here by your prayers and by the help you have given in so many ways. May the Lord and His Mother bless you all!